In these pages are discussions of theory, exhortations to students, recollections and reminiscences, questions and answers, accounts of notable occasions, and more. They show an ancient teaching that has taken on new life and is changing the lives of many for the better. Ian Hetherington has taught Vipassana meditation as a representative of S.N. Goenka since 1993. He is the author of Realizing Change: Vipassana Meditation in Action, published in 2003. He lives in the United Kingdom with his wife (also a Vipassana teacher) and their son. 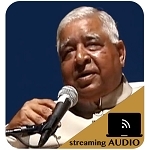 This book provides unique insights into the history of Vipassana as taught by S. N. Goenka from the time he left Burma in 1969 to go to India until the present through the use of Vipassana Newsletters, the first of which appeared in 1974. The newsletters also provided a vehicle to present the teachings of the Buddha, discuss the theory, and encourage students as to how this can be integrated into everyday life. The articles are divided into five general categories. The first is Vipassana Teachings that starts with the Buddha's first discourse. 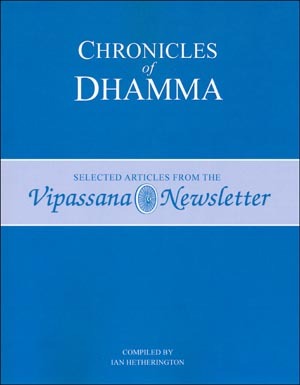 The second is Messenger of Dhamma that follows Goenkaji through milestones of his years of teaching. The third is In the Footsteps of the Buddha which first focuses on pilgrimages through India and into Myanmar. It also covers later journeys into North America and Europe. The fourth is Applied Dhamma that reflects on the use of Vipassana in prisons, addiction, at the World Economic Forum, and with students and young people. It also includes Goenkaji's encouragement to student from the first newsletter in 1974. The fifth is The Spread of Dhamma focusing on the development of Dhammagiri, the Global Pagoda, three articles on Dhamma service, and more. There are interesting photos that range from the early student private accommodations in the original thatched mud huts to the grandeur of the Global Pagoda. There are also photos taken during the pilgrimages. Overall, it provides a panorama of how the Buddha's Second Sāsana started as a trickle on its way to becoming a mighty river. I found it just wonderful because it contains stories about the service of the early AT never heard elsewhere and speeches of Goenkaji to his Indian students translated from the Hindi. Moreover, it is the first book which give the whole picture of the spreading of the Dhamma in the world as well as the particular experience of those who were involved in it from the very beginning.